Damage of houses belonging to Al-Najjar Family in Mawasi in Khan Younis after Israeli forces targeted a nearby agricultural land on Wednesday dawn, 13 December 2017. 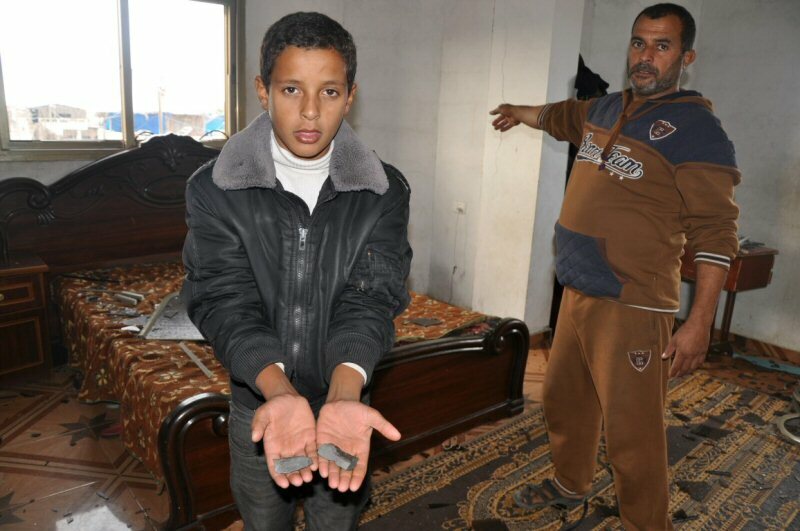 Nablus: The clashesresulted in the injury of 11 civilians, including a child, with rubber-coated metal bullets. 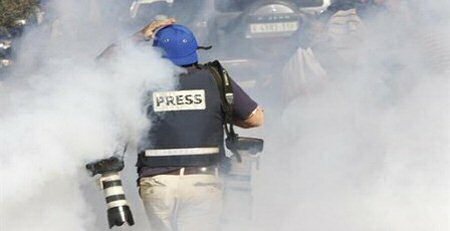 November 2017, witnessed a number of violations against media freedoms in Palestine, almost identical to those recorded in the previous few months, in September and October, a total of 26 and 28 violations against media freedoms were monitored by MADA, 26 attacks last November. The Israeli occupation carried out 16 attacks, while Palestinian authorities in the West Bank and Gaza Strip committed a total of 10 violations, PNN reports. The Israeli occupation has committed a total of 16 attacks against media freedoms during last November, some of which fall under serious violations. The most prominent of these is the decision by an Israeli military court to imprison the broadcasters of the “Sanabel” radio from the city of Hebron: Muntasir Abdel-Karim Nassar, Nidal Amro were sentenced to 22 months in prison and a fine of 5,000 NIS and Mr. Omran was sentenced to 16 months. The decision came after months of detention, when Sanabel was raided on August 31, 2016, and its equipmentswere confiscated under the reason of “receiving money from Hamas”. While the charge of incitement was the most prominent, which was directed to the three journalists Nassar, Amro and Omran, which shows the difference between what was said during the raiding and confiscation of the radio equipment and between the closure and the arrest of a number of workers and sent to trial later. In addition to the trial of these journalists, the Israeli occupation forces detained two journalists during the past month. They also detained a group of journalists and staff of seven media organizations for several hours, preventing them from covering a peaceful march against the settlements. Last November, a total of 10 violations were committed by Palestinian authorities (two in the West Bank and eight in the Gaza Strip). The most prominent of these was the decision by the Palestinian Ministry of Information to prevent the journalist Reem Al-Omari from keeping her position as director ofAhla FM local radio station and demanding that she has to be removed because the Ministry of Interior affairs refused to approve her as a director for reasons that were no explained. This violates the freedom of expression guaranteed by the Palestinian Basic Law. Journalists working in 8 different Palestinian and foreign media outlets were attacked and where prevented from covering the anniversary of the death of President Yasser Arafat that was held in Gaza, and the only media institution that was able to cover this occasion was Palestine TV, although all the journalists had advanced permits to cover this occasion. In addition an indirect threat was directed to an employer by the Palestinian intelligence to lay off a media student who works for him. The Palestinian Center for Human Rights (PCHR) condemns the Israeli authorities’ decision to decrease the fishing area to 6 nautical miles off the area from the Gaza Valley to Rafah City in the south. According to the Israeli decision, the Palestinian fishermen in the Gaza Strip are banned from sailing and fishing freely and denied them access to the areas where fish breed. Nizar ‘Ayash, Head of the General Union of Fishing Workers in the Gaza Strip, said to PCHR’s fieldworker that on Monday, 11 December 2017, the Israeli authorities informed the Palestinian Civil Affairs Authority of decreasing the fishing area to 6 nautical miles from the Gaza Valley to Rafah City in the south. This decision will enter into force at 15:00 on Tuesday, 12 December 2017, restricting fishermen and their movement in the Gaza Waters. It should be mentioned that the Israeli authorities previously allowed the Palestinian fishermen to sail up to 9 nautical miles in the above-mentioned area on 03 May 2017. Calls upon the international community to pressurize the Israeli authorities into ending the naval blockade, which led to the deterioration of the fishermen and their families’ living conditions, and stopping all violations against the Palestinian fishermen in the Gaza Strip. In its Weekly Report On Israeli Human Rights Violations in the Occupied Palestinian Territories for the week of 29 Nov. – 06 Dec. 2017, the Palestinian Center for Human Rights found that Israeli forces continued systematic crimes in the occupied Palestinian territories this week. A Civilian was killed by Israeli settlers in Qasrah village, southeast of Nablus. A child Succumbed to his wounds he sustained in the 2014 Israeli offensive on the Gaza Strip. 8 civilians, including a child, were wounded in the West Bank and Gaza Strip. Israeli forces wounded 5 Palestinian civilians in the West Bank while wounded 3 civilians, including a child and a woman, in the Gaza Strip. In the Gaze Strip, the Israeli warplanes carried out several airstrikes at military training sites of the Palestinian armed groups. As a result, Palestinian civilians sustained wounds in addition to material damage in the sites. The Israeli forces also continued to chase Palestinian fishermen in the Sea. During the reporting period, Israeli forces conducted at least 75 military incursions into Palestinian communities in the West Bank while they conducted 15 incursions into Jerusalem and its suburbs. During those incursions, Israeli forces abducted at least 94 Palestinian civilians, including 20 children and a woman, in the West Bank. Twenty four of them, including 11 children and a woman, were abducted in Jerusalem and its suburbs. As part of the collective punishment policy applied by the Israeli forces against the Palestinian families of those accused of carrying out attacks against the Israeli forces and/or settlers, early on Friday, 01 December 2017, Israeli forces demolished a house belonging to Mohammed Zeyad Abu al- Rab in Qabatyah, southeast of Jenin. The one-story house established on an area of 140 square meters sheltered 5 individuals, including 3 children. It should be noted that, the Israeli forces accused Mohammed of carrying out a stabbing attack in Kafer Qasem in Israel on 04 October 2017 and killing an Israeli. In the Gaza Strip, medical sources in the Gaza European Hospital in Khan Yunis announced on 06 December 2017, the death of Mohammed Abu Haddaf (9) from al-Qararah, northeast of the city. Mohammed’s Family said to PCHR’s fieldworker that on 08 August 2014, Mohammed sustained severe wounds after an Israeli warplane fired a missile at a gathering of civilians in Abu Haddaf neighbourhood in the village. As a result, 9 civilians, most of them were children, were killed and wounded. Mohammed was hit with shrapnel throughout his body and in his bone marrow, causing paralysation to Mohammed. His medical health condition was very bad from 2014, when he was wounded, until he died. In the Gaza Strip, as part of targeting fishermen in the sea, PCHR monitored the Israeli naval forces’ escalation against fishermen in the Gaza Sea although it was announced that the Gaza fishermen are allowed to sail to 9 nautical miles instead of 6. This proves that the Israeli forces continue their policy of targeting fishermen in their livelihoods. During the reporting period, Israeli gunboats chased fishing boats and opened fire at them 14 times; 8 of them in the north-western Beit Lahia, 5 of them in the western Sudaniyah area, west of Jabalia in the northern Gaza Strip, and one in the Gaza City Sea. As a result, 5 fishermen, including a child, were abducted but later released while their boat was confiscated. At approximately 11:00 on Thursday, 30 November 2017, a group of armed Israeli settlers moved into Ras al-Nakhil area, east of Qasrah village, southeast of Nablus. A settler opened fire at Mahmoud Ahmed Za’al ‘Oudah (48), who was working in his land. As a result, Mohammed sustained a live bullet wound to the right armpit. The bullet penetrated his heart and exited the left armpit. A number of the village residents rushed to the crime scene and attempted to save Mohammed’s life, but he died. Following that, clashes erupted between the settlers and the outraged residents. Thus, an Israeli force moved into the area to protect the settlers and opened fire at the residents. As a result, Fayez Fathi Darwish (47) was hit with shrapnel to the right knee. He was taken to Rafidiya Hospital in Nablus to receive medical treatment.’Ouda’s dead body was evacuated by an ambulance of Palestine Red Crescent Society (PRCS) to one of the City’s hospitals. However, the Israeli forces stationed at Howarah checkpoint at the southern entrance to the city stopped the ambulance. The soldiers called for an Israeli ambulance that came and took the dead body to the Forensic Medicine Institute in Israel for anatomy. At approximately 17:00, a number of settlers protected by the Israeli forces gathered at the entrance to Qasrah eastern village, and provoked the residents. After that, a number of youngsters threw stones and empty bottles at the settlers and soldiers, who immediately opened fire at them. As a result, Amir Mo’tasem Mahmoud ‘Oudah (22) sustained a live bullet wound that settled in the pelvis. Amir was transferred via a PRCS ambulance to Rafidiya Hospital. When the ambulance left the village, the settlers threw stones at it. As a result, the glass of the left window broke down. At approximately 18:30 on Friday, 01 December 2017, the Israeli forces handed ‘Ouda’s dead body to a Palestinian ambulance at the intersection of Jeet village, northeast of Qalqiliyah. ‘Ouda was buried on Saturday, 02 December 2017, in the village cemetery. As part of the Israeli settlers’ attacks against Palestinian civilians and their property, on 30 November 2017, Israeli settlers attacked Asma’a Shoyoukhi (53) and her daughter Raghad (17) when they were in al-al-Sharaf neighborhood in Jerusalem’s Old City. As a result, they sustained bruises. Asma’a said to PCHR’s fieldworker that a number of settlers attacked her and her daughter and beat them with belts and a metal pole and verbally insulted them. The Israeli police abducted the abovementioned civilians on claims of attacking settlers. During their detention in al-Qeshlah police station, Asma’a asked the interrogator to check the surveillance cameras in the scene. After checking the cameras, it showed that Asma’a and her daughter are the ones who were attacked by the settlers. On 30 November 2017, a group of settlers from so-called ‘pricetag’ groups from “Yitzhar” settlement protected by the Israeli forces attacked the south-eastern outskirts in ‘Asirah al-Qabliyah village, south of Nablus. Following Friday Prayer on 01 December 2017, dozens of Palestinian civilians, international human rights defenders and Israelis organized protests in Ni’lin and Bil’in villages, west of Ramallah, al-Nabi Saleh village, northwest of the city and Kafer Qadoum village, northeast of Qalqiliyah; in protest against the annexation wall and settlement activities. Israeli forces forcibly dispersed the protests, firing live and metal bullets, tear gas canisters and sound bombs. They also chased the protestors into the olive fields and between houses. As a result, many of the protesters suffered tear gas inhalation while others sustained bruises due to being beaten up by the Israeli soldiers. Due to the number and severity of Israeli human rights violations this week, the PCHR made several recommendations to the international community. 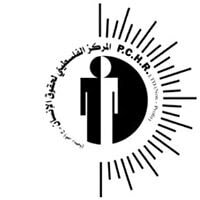 PCHR calls upon the international community to speed up the reconstruction process necessary because of the destruction inflicted by the Israeli offensive on Gaza. The PCHR calls for a prompt intervention to compel the Israeli authorities to lift the closure that obstructs the freedom of movement of goods and 1.8 million civilians that experience unprecedented economic, social, political and cultural hardships due to collective punishment policies and retaliatory action against civilians.